Happy Tuesday everyone! Fall is in full swing over here on the West Coast with very chilly morning and evening temperatures. With the sudden temperature drops, I wanted to share one of my everyday fall go-to looks. I'm hoping and planning to create a series of Fall outfits that are both versatile and easy to replicate so stay tuned! Today's look is the perfect introductory Fall outfit because of it's layers and ability to adapt to various temperatures. Mules are appropriate for this outfit because it isn't bone-chillingly cold yet, but they can easily be swapped out for a pair of your favourite booties once it gets colder. If there is one thing to take away from today's post, it's to invest in a good cardigan, particularly a long, oversized one. Cardigans can be worn over jeans, belted over skirts, used to replace coats and jackets (depending on how cold it is), and are overall so damn cozy. As most pieces described so far are simple and neutral, I decided to inject some Fall colour by pairing the look with a burnt orange tank. This colour screams Fall for obvious reasons but there are so many colours you can choose to wear this coming season. Reds (as seen in this post), pinks, metallics are all a go, so get creative and have fun! The last addition I made to complete this easy Fall look was adding a pair of round glasses. The working girl (and by working girl I mean cubicle corner not street corner =P) is predicted to be a huge trend for Fall/Winter 2017-2018. I do normally wear prescriptive glasses but this particular pair was a fun ornamental pair I picked up from one of my favourite online sunglass/eyeglass shops, Sunglass LA. I hope you enjoyed my first look from my Easy Fall Look Series as well as a few trends to be aware of over the upcoming months! That look is so cute! I just love that Gucci bag. This look is stunning! Seeing your cardigan reminds me of the fast approaching Fall season - I'm still not ready. Ah, lol. Que guapa estás y esos pantalones te sientan muy bien, el cardigan también me encanta. Un fuerte beso. I love the outfit.Nice and stylish and looks so comfortable too.Loving the color of your top. This knit looks so cozy! Ahh, I love the Fall season. You get to mix so many prints and textures. :) I'm envious. I only get cooler weather for another 2 weeks. This look is so simple and effortless yet so chic! I love it - I'll definitely be recreating it! Totally Agree, this is the perfect fall outfit. You look so chic, I love this fall look! You hair is amazing! you looks gorgeous great pictures.. I love your ootd Rina! This really is a beautiful fall look. I love your style and your curly hair. Have a wonderful Thursday! Rina those jeans are perfection on you! Love the you make the combo, all perfectly match. You look gorgeous, thank you for sharing!!! i just love looks like this, easy and chic and you look stunning! Nice look! I love a good cardigan! And I'm surprised it's chilly in the west it's still warm here like 79- 80ish in D.C. I love this laid-back style. A long oversized cardigan has been on my to-buy list for a while now!! Such lovely photos btw. The days are flying by and I can't believe that Fall is here. I am smitten with your gray cardigan. Its the perfect layer for the start of fall and it looks great with your jeans. I bet it would also look amazing paired with a skirt or dress. I am looking forward to seeing more of your fall fashion babe. Enjoy your evening. Lovely outfit babe! Love the bag so much! This is a great Fall look! I really love the your cardigan! I love this fall look, I need a gray cardigan like that! I love your style! 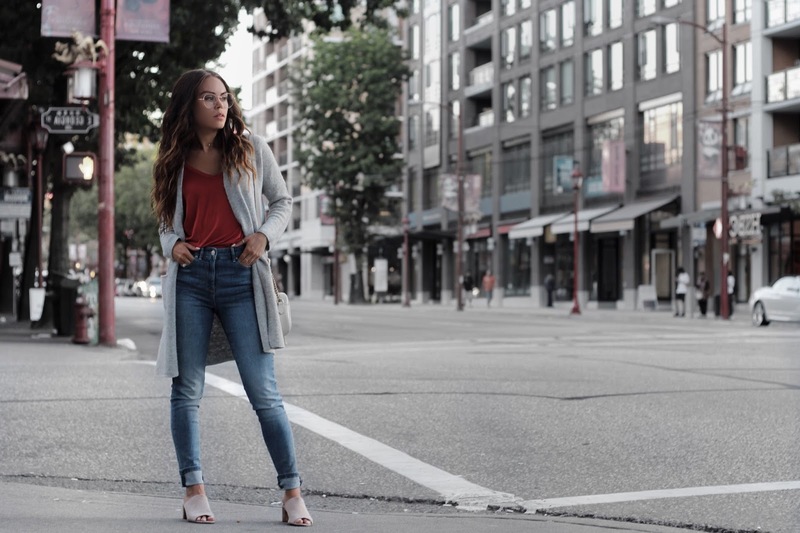 The long grey cardigan, cinnamon red top and blue jeans look pretty styled together, and you look awesome wearing them! I love this fall look so much. It would be so easy to recreate as it really is perfect for fall. 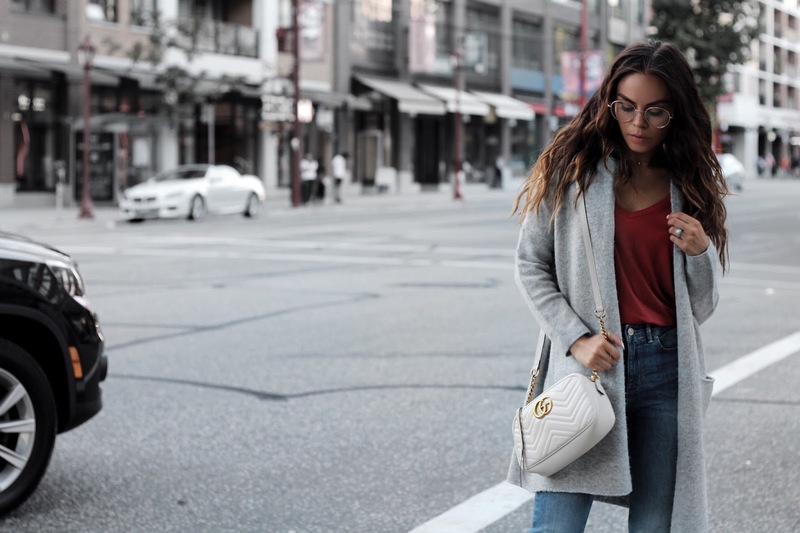 I agree a long cardigan always saves the day and is super easy to style. Plus, looks so good on. I love all of your posts so much - you have this effortless style that isn't easily replicated! I've been too scared to wear my pair of round glasses because I feel like they won't go with any outfit but you pull this off so well! Dear, you look effortless gorgeous! I love your hair, and those glasses really complete the whole look. That cardigan is elegant, your jeans are perfect fit. Tan sencillo y con tanto estilo en un mismo look, me encanta. what a beautiful look! love the cardigan and those shoes are so gorgeous!